The letter, written and addressed to your highness regarding search and seizure of Baha’i homes and private educational centers and confiscation of all training materials and equipment by authorised officials, has been sent to you. 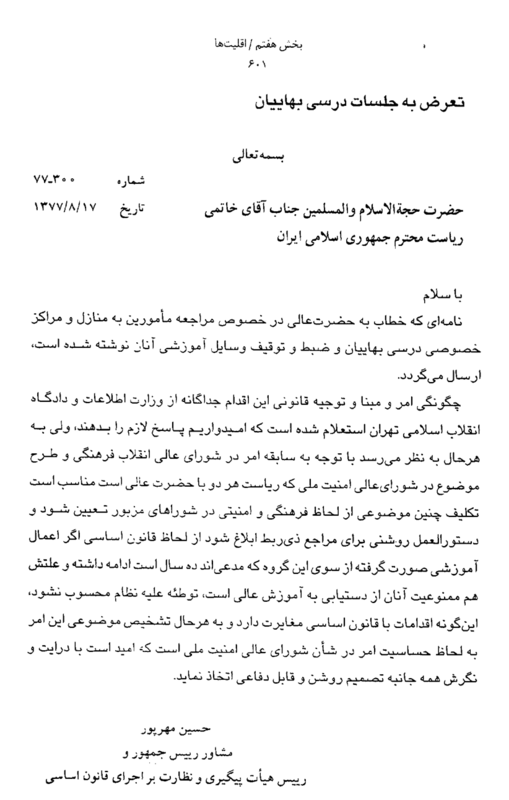 An inquiry has already been communicated to the Ministry of Intelligence and the Islamic Revolutionary Court regarding the circumstances surrounding this matter, including its background and legal justifications, to which we hope to receive the necessary response. However, due to the history of this issue at the Supreme revolutionary Cultural Council and its review and evaluation by the members of the Supreme National Security Council, both spearheaded by your excellency, it would be expedient to finalize this issue both from the cultural and security stand points by the said Councils such that clear guidelines may be issued to the relevant authorities. Thus, on this basis the educational activities of this group which, they claim, has been ongoing for the past ten years (due to their prohibition in accessing higher education), would no longer be considered conspiratorial and in opposition to the regime based on Iranian constitution. In any case, due to the sensitivity of the situation, the resolution of this matter which should lead to a final decision falls within the jurisdiction of the Supreme National Security Council. It is hoped that a judicious, credible and comprehensive decision can be agreed upon.